Kathryn David is a research assistant at the Holocaust Museum, and was a 2012 Fulbright recipient in Ukraine. She will be joining the doctoral program in History and Russian & Slavic Studies at NYU in the Fall. Ukraine’s Jews have been used as a tool in the propaganda war between the “pro-EU” Maidan protesters and the “pro-Russia” (or more aptly “anti-Maidan”) forces in Ukraine since the beginning of the crisis. The stakes were raised to a dangerous and terrifying level when a flyer surfaced on social media purportedly from the autonomous republic of Donetsk demanding local Jews register with the government or risk expulsion. If the text of that flyer sounds familiar, it’s because it was supposed to. The Nazis and their allied governments made similar demands of their state’s Jewish residents before committing a genocide whose extent is shocking even by today’s standards. 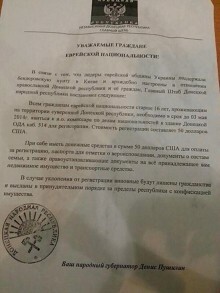 The flyer has been widely discredited by Donetsk’s Jewish community and the Donetsk government as a forgery meant to portray the pro-Russian movement as anti-Semitic. What we know for sure is that the flyer was posted at a local synagogue, but not from anyone in a position of authority and certainly not from any government. There is a small chance that the flyer was distributed by anti-Semitic fringe elements, but the case of the flyer as propaganda is much more convincing. The territory of present-day Ukraine has seen a variety of governments, and none of these governments have treated the Jewish population well. The Russian Empire confined its Jews to the Pale of Settlement and sanctioned countless pogroms. The empire also created an even more famous forgery than this flyer: the Protocols of the Elders of Zion. That document was used as “evidence” of a Jewish conspiracy to dominate the world and as a justification for pogroms. The Soviet Union originally wooed Jews with the promise of equality under communism only to purge all Jews from its ranks and treat them as second-class citizens. Much of Ukraine fell under Nazi occupation, resulting in the death of millions of Jews in a “holocaust by bullets” leaving scores of Jews in mass graves that even the Soviets, sworn enemies of the Nazis, refused to acknowledge. After the fall of the Soviet Union, right-wing forces in Ukraine blamed Jews for oppression under communism. To this day, the right-wing of Ukraine’s nationalists refuses to acknowledge the struggles that Jews faced under communism and many deny the Holocaust. In my own experience of living in Ukraine, low-level anti-Semitism is everywhere, directed at me “jokingly” when I identified as Jewish in conversation and directed at fellow Jews when those around me did not know I was Jewish. Both the pro-Russian and pro-EU sides have their anti-Semitic elements and the histories that the ideological members of the movements celebrate are filled with anti-Semitism. Ukrainian nationalists heroically fought against Soviet oppression, but teamed up with the Nazis to do so. While for some it was an uneasy alliance, other Ukrainian nationalists were deeply anti-Semitic and enjoyed the support of Nazi power to murder their Jewish neighbors and commit pogroms. Those in Ukraine that see their future with Russia celebrate the history of the Russian Empire and the Soviet Union, empires that promised a better life for the Jews and never delivered. Many of Putin’s supporters see a Russia free of Jews and other ethnic minorities as the ultimate goal. Yet neither side has made anti-Semitism the crux of their movement except when denying that it exists among their ranks. So what was the point of the flyer? Yet both sides know that the other has vulnerabilities when it comes to its history with Jews. Up to this point, it has mostly been the pro-EU, anti-Yanukovych side that has bared the brunt of the accusations of anti-Semitism. This flyer was most likely created to shift those accusations to those supporting Russia in their stronghold of Donetsk. What made this piece of propaganda different from all other propaganda? What made it so different that the U.S. Secretary of State did not investigate its authenticity before condemning it? What made Jews in Israel and the United States post the article on social media with comments of fear and deep concern? What made media outlets around the world pick up the story with no comments on the document’s authenticity? The flyer played upon the fears that continue to plague Jews around the world: unstable governments will ultimately turn their forces on the Jews, especially countries with long histories of anti-Semitism. The flyer also played on a concern of the media and diplomats like Kerry: Next time a genocide happens, we do not want to be the ones who did nothing to stop it. These concerns are all valid. Anti-Semitism is on the rise throughout Europe, especially as European economies falter. The changing nature of journalism means that many news networks simply want to be the first to report on something. In addition, networks often ignore nuanced issues and instead try to explain the gist of any event in 140 characters. This culture means that the most nuanced stories; the ones that show evidence of racially motivated violence around the world are avoided. No matter who is responsible for the flyer, it is troubling how far the propaganda has gone. The Holocaust and the world’s deep-seated fears and insecurities about it are fair game in today’s Ukraine. How far will each side go to paint the other as anti-Semites? And who will end up the ultimate victim? The Protocols of the Elders of Zion was one forgery whose purported authenticity justified acts of violence for hundreds of years, including today. What will be the consequences of this forgery?